Erdoğan (2nd R), accompanied by first lady Emine Erdoğan (3rd R), Azerbaijan's Aliyev (R), Kazakh, Uzbek and Georgian leaders and their delegations look at trains during the inauguration ceremony of the Baku-Tbilisi-Kars Railway, Baku, Oct. 30. Normally when a new rail link opens, analysts mostly focus on technical aspects such as gauge, length, speed and type of trains in addition to construction costs. However, all of this changed when in the otherwise reasonably foreseeable world of platforms, rolling stock and tracks a week ago on Oct. 30 something totally out of the ordinary took place at Baku's new port facilities in Alat. 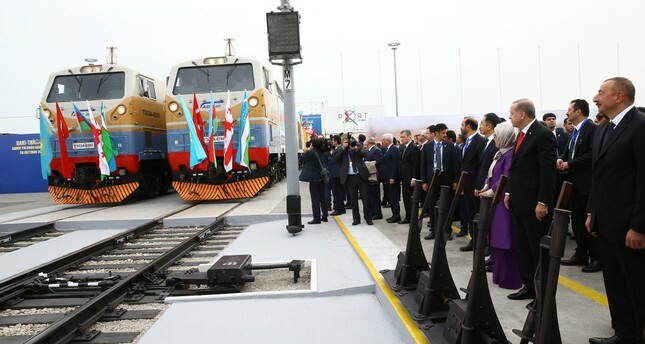 The Azerbaijani capital had hosted the opening ceremony for the Baku-Tbilisi-Kars (BTK) Railway project. Granted, one has to state the technical facts, too, but even then there is so much more to report; an entirely new dimension of what a railway is intended for and expected to deliver, not simply in terms of freight or passenger capacity, but in a whole new category, as if in a league of its own. A total of 846 kilometers of track now connect Azerbaijan, Georgia and Turkey via the BTK Railway. Of that, 109 kilometers are newly laid track, 30 kilometers in Georgia and 79 kilometers in Turkey. In its initial stage, 1 million passengers and 6.5 million tons of freight are expected to be carried on the BTK Railway, with plans to increase these already impressive figures to 3 million and 17 million, respectively, by 2034. It is said that the total potential is even bigger and could jump to 50 million tons of freight at some point in the future. The costs are still to be seen in relation to the enormous project and have yet to be disclosed in full, but from what we know, the project is financed both by Azerbaijan, which is extending a $775 million loan facility to Georgia, and by Turkey. A figure closer to $1 billion seems to be a first estimation of the line's total construction costs not factoring in later upgrades. As the opening ceremony was widely covered in the media and is now one week in the past, let us immediately approach a somewhat wider picture, a sort of looking into the future, something more of an opinion. What is at stake? By completing the BTK Railway, all three countries involved opened the door to something much bigger. Maybe that was not intended at the project's inception, as the original BTK Railway plans date back well over two decades ago, with the tri-lateral pen put to paper not before 2007, but since then China came up with a remarkable initiative in 2013 to revive the ancient Silk Road route. And from that moment onward, everything BTK Railway-related had a new meaning. Beijing had for sure and for much longer mulled plans for what was from 2013 called the One Belt One Road (OBOR) initiative long before going public, but it had not been before that crucial date in 2013 that myriad events, symposia and conferences, including high-level government meetings on an international scale, were penciled in to attract widespread interest and ideally support for Beijing's plans. Many commentators will struggle to understand the hesitations in the West concerning Beijing's ultimate motives. Closely following the May 14 One Belt One Road International Summit held in Beijing earlier this year, one was surprised about a supposedly nothing but lukewarm reception to the OBOR by some European countries, apparently misinterpreting its huge potential, in particular for their market economies. Railways – the same as a sea corridor or roads, for that matter – are never one-way trade routes, as whatever leaves China can be matched by whatever enters the Chinese markets on return – it simply depends on multi-lateral trade negotiations and freight capacity structuring a win-win situation. Misunderstanding the OBOR as just another means for China to penetrate European, including Turkish, markets, is wrong. And what many misunderstood, too, is that it is not only Chinese goods traveling to Europe, but that at all other stops along the route, companies can load their own containers and off they go to Europe, or China, or anywhere in between. If we take London as the western-most point of the middle corridor railway project and Turkey as its central gateway, then traveling via Georgia and Azerbaijan onto Kazakhstan with a ferry link across the Caspian Sea and straight into China, we immediately realize that this land route, except for the abovementioned Caspian Sea crossing, is the safest, easiest and most logical to put together and to pull off out of a number of alternative options. It can reduce freight travel times between both endpoints to just below 15 days. It is not only the countries where the trains will actually pass that are of importance, although they are the initial beneficiaries. Think neighboring states, think related trade options. And then we must add the sea corridor of the OBOR, including access to East Asia, India and Eastern African countries before reaching the Mediterranean. We then arrive at the remarkable number of potentially 60 countries accounting for 4.5 billion of our shared world's population and one-third of the world's gross domestic product (GDP). Who says size doesn't matter? If we leave the OBOR to the side for a moment or two we should not overlook the positive dynamics for Turkey, Georgia and Azerbaijan analyzed separately. Azerbaijan and Turkey, which have always been close to each other, by adding Georgia as the inter-connecting country, can thus further increase their own tri-lateral trade volumes. But there is even more – is it not correct to say that where goods travel people will soon follow? One would expect that quite a significant increase in tourism either between any two of the countries or all three will be seen in the very near future. With easy onward connections to all of Turkey and via the Marmaray tunnel soon to central Europe, too, rail travel, which for some decades was something no longer en vogue as everyone could take to the skies, will be revitalized. And let us never forget, not everyone takes to the skies, far from it. Traveling by rail is exciting as you see the countries you pass through, it is highly convenient, basically door-to-door and, above all else, often cheaper. It remains a vital mode of public transport including in all three BTK Railway countries. For writing this op-ed, it made sense to search past Silk Road conference notes, and one stood out in particular. It was a joint venture of the Financial Times (FT) and the European Bank for Reconstruction and Development (EBRD), which took place in February 2016, here in Turkey in its financial hub of Istanbul. On that occasion, a real Silk Road expert and investment fund CEO, Clemente Cappello, shared his insight, and ever more remarkably so as a financial deals expert, highlighted a potential benefit of the new Silk Road most would overlook or neglect – the human dimension and the human capital dimension. According to Cappello, a huge potential of human capital needs to be unlocked, bringing education, training and ultimately jobs to all the countries along the new Silk Road middle corridor railway. He told me that the current brain drain of many Central Asian republics could thus be stopped, bringing prosperity and a better future to many there. Much food for thought that the OBOR is so much more than a mere transportation venture, as in the end it is about the people living and working along that middle corridor and the related sea corridor, too. One can add that Turkey could not only support these measures, but let other countries learn from its tremendous success in building its very own middle class based on small and medium sized enterprises (SME) in turn based on individual entrepreneurship, access to funds and innovative manufacturing tools. In a nutshell, the BTK Railway benefits first and foremost all three countries and its citizens involved. Yet there is the wider, new Silk Road aspect so obviously attached to it, and of course, Turkey is at its crossroads. If implemented correctly, it will create a better future for billions of people living along the route as well as along the sea corridor, it will enhance education and job opportunities in those countries and regions, it will help individual citizen travel and learning about new cultures and new friends, as well. For me, the BTK Railway stands not only for Baku-Tbilisi-Kars but for Azerbaijan, Georgia and Turkey and one day soon for all countries and proud inhabitants along the new Silk Road's middle corridor. It will bring prosperity, or for those already fortunate, more prosperity, and engaging in solidarity with temporarily less fortunate neighbors. Would it be untimely for an enterprising nation-state like Turkey to be at the forefront of this huge venture, becoming a bridge builder between East and West once again? Not at all, to the contrary. Would a successful revitalized Silk Road middle corridor anger Russia? Not necessarily – as long as OBOR designers factor in the Russian potential both for their own, as well as the vast Russian market, a frequent branching off of the middle corridor toward Russia is absolutely vital. Russia would become part of this win-win on all sides.